This is a program supported by the USMMA Sailing Foundation. It was started by the Duclay brothers, Killian and Sean, to expose local veterans to the community of sailing. Their Sail Race Team is out of the gates training hard at Oakcliff and ready to compete this summer in a variety of regattas including Ida Lewis Long Distance, Vineyard Race, Vanderbilt Cup, Winkly Cup, Cedar Point One Design, Around Long Island Race, and more! Sail Ahead is also nurturing partnerships in the area with West Point and Verizon for events like Let’s Take a Veteran Sailing on August 6 and Lauren Kristy sailing on September 16. 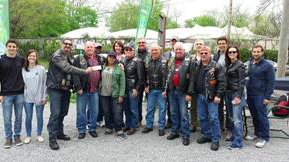 Plus, they had a great donation surprise from the American Legion Riders Post 1244 Greenlawn. Try to keep up with these boys that are movin’ and shakin’.